We spent three days in Interlaken and its environs. I'm running out of superlatives. The pictures will have to speak for themselves. We enjoyed going to church here which made it a special place. 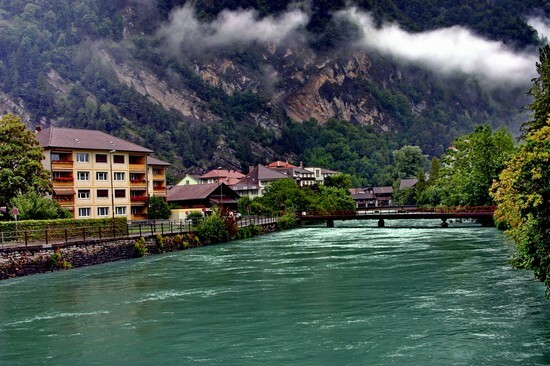 This was my second time to Lauterbrunnen, a short train ride out of Interlaken. It is hands down the MOST beautiful spot in Switzerland. I don't think I'd have to defend that to anyone. For anyone who cares, THIS is where Happy Pants was born. A camping resort for which I have fond fond memories. I vowed I would bring Paco here. Mission accomplished! On another day trip we rode the train up to Wengen and hiked down. It was very steep and challenging, and I admit I murmured. Next time we'll go up to Murren and hike down, one I've done and loved. If you ever have to make the choice, choose Murren. Both villages are carless (which incidentally I am also--someone took our Subaru out). A yard full of model trains on the way down from Wengen. A perfect view of the Lauterbrunnen Valley. My son-in-law spent a week skiing here right before he married Shelly.